Self care is so important in our busy lives. 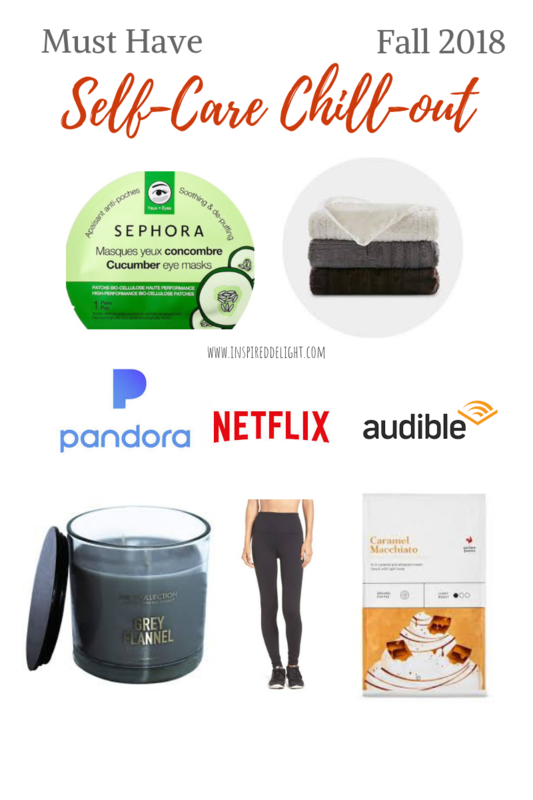 Here are some of my favorite things to make “me time” that much better! Under-eye masks: From Sephora and so good. $5 each – can’t beat that! Audible: I love a good motivational book but have a tough time squeezing in time to read in my busy day. Audible to the rescue! Currently listening to “Girl, Wash your Face” by Rachel Hollis while driving or walking. Music: “Alexa, play smooth jazz”. We have Alexa hooked up to our whole house and outdoor speakers and love it!! I also enjoy Pandora stations like Maroon5 and Ray LaMontagne. Netflix: Someone coined the phrase “Netflix & chill” for a good reason. Blanket: To Netflix & Chill you must have a cozy blanket. Leggings: Zella are still my favorite. Pair them with a comfortable shirt and there ya go! I hope this inspires you for some time to care for yourself and relax for a bit. Even if it’s for a 20 minute eye mask session while you sip a cup of Caramel Macchiato before the kids get up. Any time you can devote to self care is so important in our busy, busy lives.